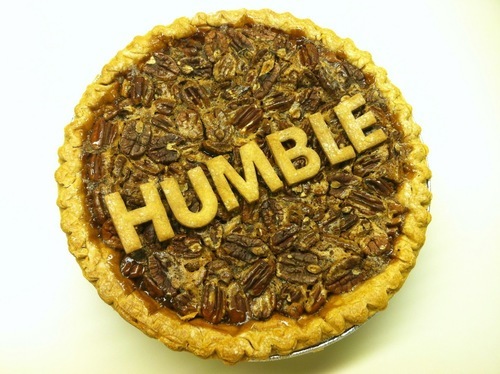 10.2 Serving Up a Slice of Humble Pie. The “First Week”: Week Ten/Session Two. Theme: God’s Merciful Love for Me. Our reading for today: Luke 18: 9-17. After nearly sixty years of following Jesus, it would seem reasonable to me to believe that my passport to heaven has certainly been signed, sealed and delivered. While I’ve never seen myself as a perfect man, there are times, when left to my own devices, when I can easily believe that anyone with my track record with God should pretty much have an insider’s seat with the King of Kings. And…being a pastor for nearly thirty years, you see, doesn’t help with that holier-than-thou attitude as well! It’s kinda funny at times. Over the years, I’ve had well-meaning folks come up to me, asking me to pray for them, believing somehow that I must have some secret passcode to the Divine. I mean, if you’re a man or woman of the cloth, certainly you must have a certain inroad with the Master, right? At most every meal I attend, whether it be a dinner at someone’s home, or at a large wedding banquet, the host or hostess always seeks me out to pray an “official” blessing over the food. At times, I chuckle to myself, thinking maybe I should sprinkle holy water on the gravy and potatoes just to make certain all the calories have been cursed away! You see, being a minister of the Gospel can very easily go to your head. Being seen by your parishioners as a holy man who walks with God can start to mess with you. Hey, over the years, I’ve met some men and women in ministry who’ve lost it completely. The air of their holiness precedes them as they enter a room. Their noses are so high up in the air, if it started to rain, they’d drown! So it was with Jesus this day as He gathered with a bunch of religious leaders. Men so full of themselves that there was little room left for anything else but their pride and arrogance. And then Jesus told his story about the Pharisee and the tax man. Two sinners, but only one who knew it. Only one who could see how far he had fallen from the graces of God. Only one who could look honestly at himself and see his on-going great need for unmerited mercy. Only one who would be able to go home, scrubbed clean and air-dried by the powerful grace-filled wind of the Holy Spirit. Jesus closes His lesson on humility by opening up His arms to a group of snotty little kids, blessing them even as their dirty diapers smelled up the room and their grimy little hands smeared peanut-butter-n-jelly on everything and everyone they touched! Repentant tax collectors and dirty, little rug-rats get in long before those of us who believe we have earned front row seats to the big dinner party. Big time sinners who know their need and innocent little kids with soft, child-like hearts will be admitted to the banquet while some of us long-time holy men and women are shown the door. I guess that’s why Jesus will need to teach this lesson on humility again and again to those of us who, on occasion, think that we have an inside track to God’s banqueting table. Hmm. What’s that plate of food going by over there? Looks like a big dish of humble pie. Sorry…gotta go get some of that before it’s all gone! My prayer: Father God, there’s a real risk involved with long-term service to the King. Like the older son in the prodigal story, I can, at times, be found looking down at others, believing my righteousness to be all I need for instant access to Your Kingdom. For that type of thinking, Jesus, I fully repent. I’m guilty. Holy Spirit, wash me and free me from my pride. For Your name’s sake. Amen. My questions to ponder: So how might I be overlooking the ugly, religious attitude of the Pharisees that might have slipped into my heart when I wasn’t looking? Am I being openly honest about myself and am I living in the simplicity of a child as I seek first, the Kingdom of God? This entry was posted in Our Ignatian Prayer Adventure and tagged Jesus by The Contemplative Activist. Bookmark the permalink.